This Influence Plus Satin Leopard Print Midi Skirt with Slits from ASOS Curve is definitely one of my favorite leopard print pieces. This skirt is so versatile and you know how much I love versatile pieces. It can be dressed up with a nice blouse and a pair of black strappy block heels or dressed down with a sweater and a pair of sneakers like I wore on my Instagram Stories. For this look, I paired it with this lovely oversized button-up Free People top that I thrifted at my local Plato’s Closet. I tied it up for a more casual look. For my shoes, I wore my favorite go-to black sandals. 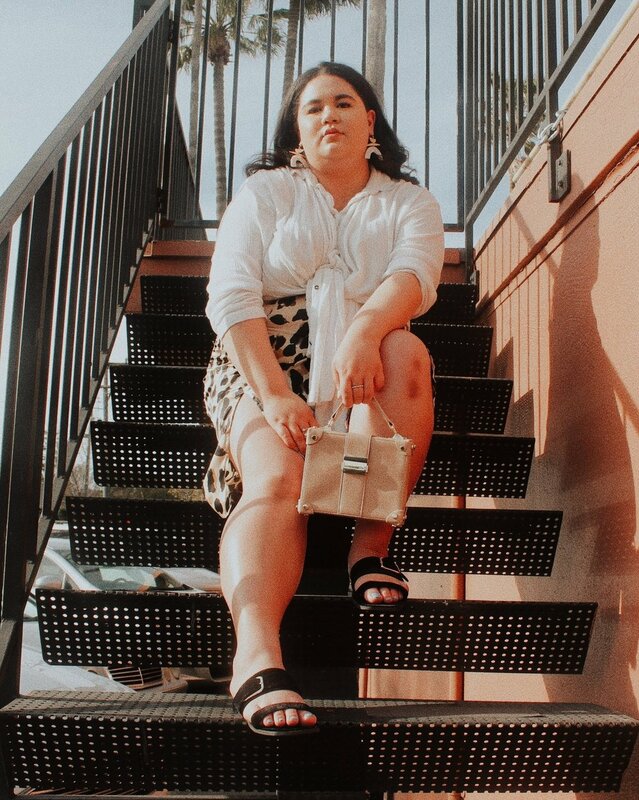 For accessories, I wore my everyday rings from ASOS Curve, my new structured mini handbag that I found at my local Ross, and my Quay Australia Sugar & Spice Cat Eye sunglasses. Finally, can we talk about these stunning white acrylic and brass handmade earrings made by Myranda Escamilla. I absolutely adore the look and design of these earrings, but what really sold me on these beauties was the description: “Reminiscent of a woman’s body. Strong. Capable. Confident.” You can shop her Etsy shop here.